We've added the state of Vermont to our State Birdorable Birds series. 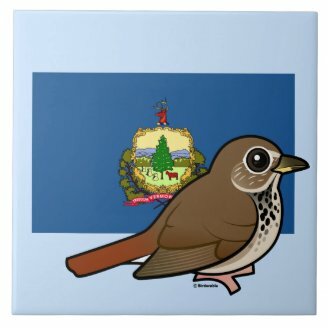 The official state bird of Vermont is the Hermit Thrush. Hermit Thrushes are known to breed in all of Vermont's counties. Most birds leave the state for warmer climates to the south after breeding season, but each year a few hardy Hermit Thrushes are found in Vermont during the winter (often during the Christmas Bird Count). 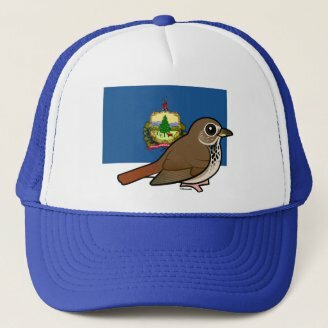 The Hermit Thrush was named the official state bird of Vermont in 1941. Apparently during the debate over naming the state bird, some legislators favored other birds, including the Blue Jay, which is resident year-round in Vermont. 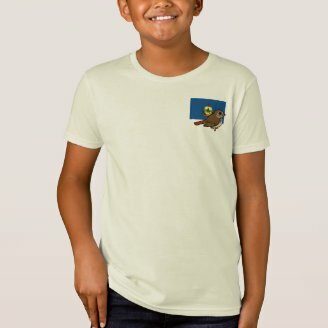 Also mentioned were "crow" and flying squirrel. Yep, a non-bird was floated as a possible official state bird to represent Vermont!